근정문은 경복궁의 중심 건물인 근정전의 남문으로 좌우에 행각이 둘러싸고 있다. 조선시대 태조 4년(1395) 경복궁을 세울 때 함께 지었으나 임진왜란으로 불에 타 버렸다. 지금 있는 건물은 고종 4년(1867) 경복궁을 다시 지으면서 새로 만든 것이다. 근정문은 앞면 3칸·옆면 2칸의 2층 건물로, 지붕은 앞면에서 볼 때 사다리꼴을 한 우진각지붕이다. 지붕 처마를 받치기 위해 장식하여 만든 공포는 기둥 위뿐만 아니라 기둥 사이에도 있다. 이를 다포 양식이라 하며 밖으로 뻗쳐 나온 부재들의 형태가 날카롭고 곡선을 크게 그리고 있어 조선 후기의 일반적인 수법을 나타내고 있다. 행각은 근정전의 둘레를 직사각형으로 둘러 감싸고 있는데, 양식과 구조는 간결하게 짜여 있으며 남행각이 연결되는 곳에 일화문(日華門)과 월화문(月華門)이 있고 북측으로는 사정문(思政門)이 있어서 사정전과 연결된다. 동·서쪽으로는 각각 밖으로 돌출한 융문루(隆文樓)·융무루(隆武樓)가 있다. 벽에 만든 창의 형태는 사각형의 모서리를 사선으로 처리한 것이 특이하다. 근정문은 현존하는 조선시대 궁궐 정전의 남문 중 유일하게 2층 건물로 지어져서 법궁의 위엄에 맞게 조성되었으며, 궁궐건축 연구에 귀중한 자료가 되고 있다. 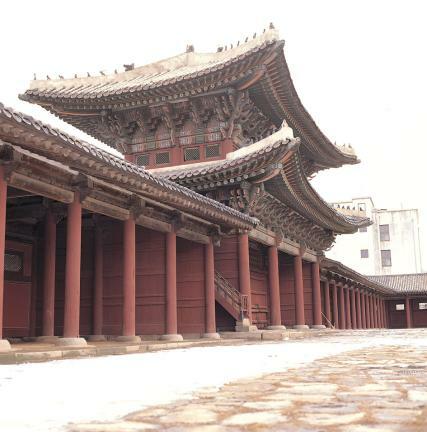 Geunjeongmun is the south gate of Geunjeongjeon, the main hall of Gyeongbokgung Palace. It is surrounded by corridors on both sides. 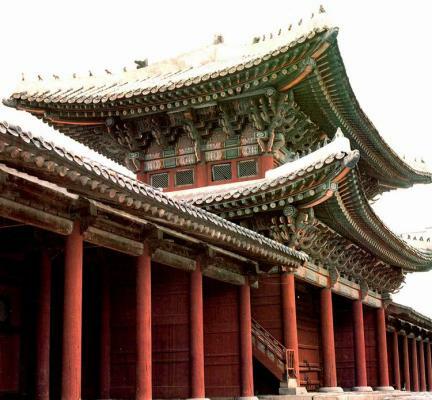 It was built at the same time as the palace in 1395, the fourth year of King Taejo’s reign, but was burnt down in the Japanese Invasion of Korea in 1592. 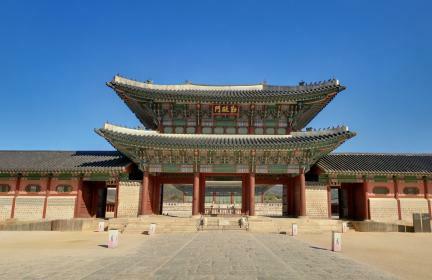 The present gate was built when Gyeongbokgung Palace was rebuilt in 1876, the fourth year of the reign of King Gojong. 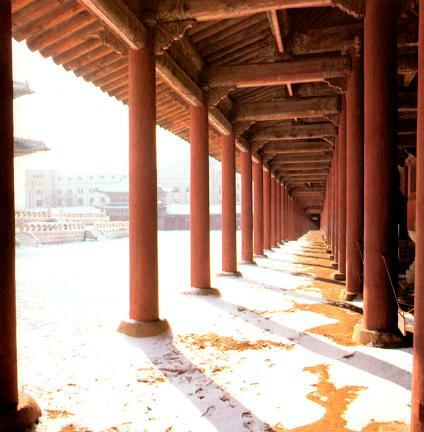 Geunjeongmun is a two-story building composed of 3-kan (a unit of measurement referring to the distance between two columns) front space and 2-kan side space. It has a hip roof called ujingakjibung, showing a trapezoid shape when looked at from the front. 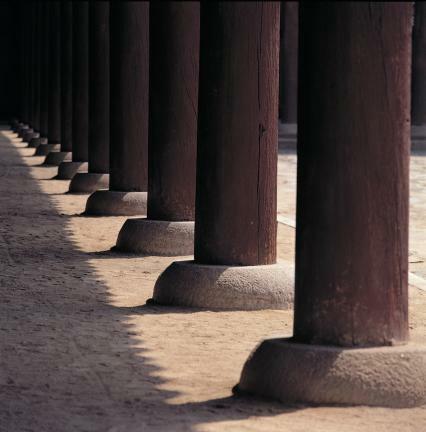 The gongpo that supports the roof eaves on the pillars is set up not only on the pillars but also between them. This building style is known as dapo style. 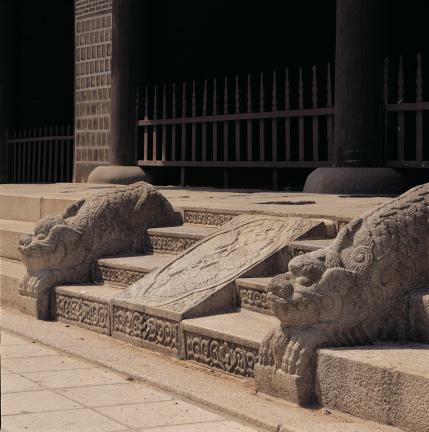 It is the typical style of the latter part of Joseon that the shape of the materials extending to the outside is sharp and forms a big curve. 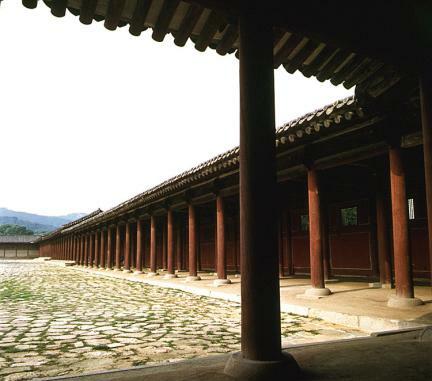 Geunjeongjeon Hall is surrounded by Haenggak, a rectangular-shaped gallery with two corridors, which were originally one. Its style and structure are generally simple. 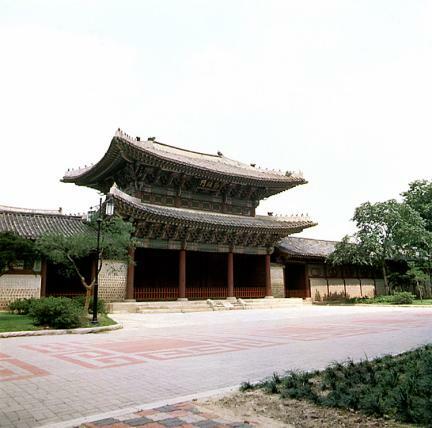 There are the gates Ilhwamun and Wolhwamun where Namhaenggak (south Haenggak) meet, and Sajeongmun in the center of Bukhaenggak (north Haenggak). 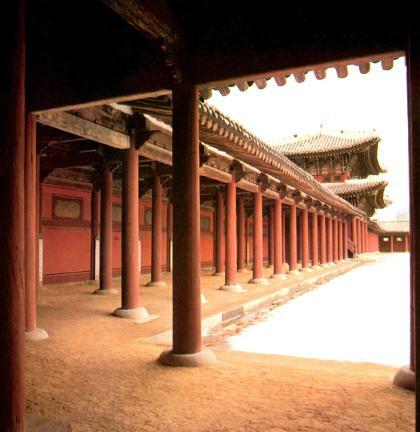 Two pavilions, Yungmunnu and Yungmuru, are placed to the east and west respectively. It has the unique features that the corners of the quadrilateral windows were made diagonally and that the style of the ceiling leaves all the materials exposed. 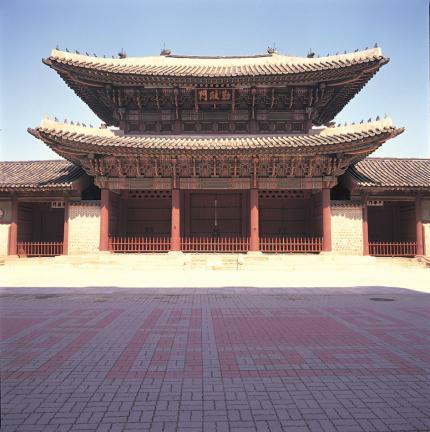 This is the only two-story building remaining among the south gates of the main palace buildings of the Joseon Dynasty. 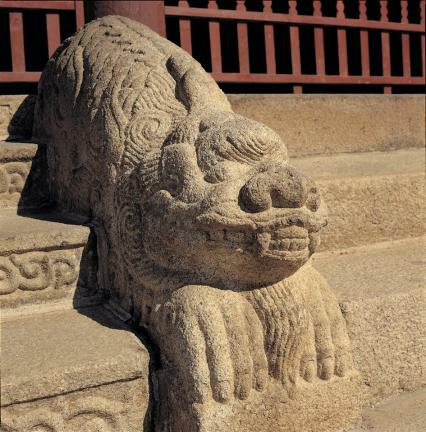 It is an important cultural asset and a source for studying palace architecture.